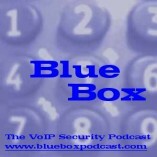 Welcome to Blue Box: The VoIP Security Podcast #86, a 19-minute podcast from Dan York and Jonathan Zar covering VoIP security news, comments and opinions. Download the show here (MP3, 9 MB) or subscribe to the RSS feed to download the show automatically. 00:20 - Intro to the show, contact information and how to provide comments. Welcome to all the new listeners - and to all those listeners who have been here for so long! Dan and Jonathan discuss what has happened in the past year and why there have not been new shows. Discussion of what some of the main issues in VoIP security have been over the past year. If you found this post interesting or useful, please consider either subscribing to the RSS feed or following BlueBox on Twitter.